Director – Joel Schumacher, Screenplay – Jeffrey Boam, Janice Fischer & James Jeremias, Story – Janice Fischer & James Jeremias, Producer – Richard Donner, Photography – Michael Chapman, Music – Thomas Newman, Visual Effects – DreamQuest, Makeup Effects – Greg Cannom, Production Design – John Warnke. Production Company – Richard Donner Productions. Sammy Emerson and his older brother Michael move to the California coastal town of Santa Carla as their mother goes to live with her father following her divorce. At a beachfront carnival, Michael becomes entranced with the lovely Star who draws him into the company of a gang of teenagers who play mind games with him. At the same time, Sammy encounters the two strange Frog Brothers who claim to be vampire hunters. When Michael returns from being out all night and exhibiting strange behaviour, Sammy becomes increasingly concerned that the gang are vampires and have seduced Michael into their clutches. With the help of the Frog Brothers, Sammy sets out to save Michael before he is fully transformed into a vampire. However, the only way to do this is to track down and destroy the head vampire. In the 1990s, Joel Schumacher has become the worst director ever accorded a multi-million dollar budget. Schumacher has conducted a list of atrocities – prime among them being the offensively redneck rant Falling Down (1993) and his reduction of Tim Burton’s Batman franchise to big-budget versions of the campy 1960s tv series with Batman Forever (1995) and Batman & Robin (1997), the latter being the single worst big-budget film of the 1990s. Even outside of that when Joel Schumacher’s films merely amount to a mediocre competence – like his various John Grisham adaptations The Client (1994) and A Time to Kill (1996), the snuff movie thriller 8MM (1999) and the psycho-thriller Phone Booth (2002) – they seem like works where he is an empty-headed purveyor of flashy visual style unsupported by anything of substance or where he has appropriated some other director’s visual look – the work of Ridley Scott, David Fincher, Lars von Trier. Schumacher should be banished to MTV where his empty-headed stylistics would be welcomed in abundance. (See below for Joel Schumacher’s other genre films). At the time of The Lost Boys, Joel Schumacher’s name did not seem like the curse word that it is now. Schumacher was a former window dresser who had broken into filmmaking as a costume designer and then gotten work writing the scripts for Car Wash (1976) and The Wiz (1978), before being allowed to make his directorial debut with the likable The Incredible Shrinking Woman (1981). Schumacher found his stride with the Brat Pack film St Elmo’s Fire (1985) and then went onto The Lost Boys, which is usually a vampire film that is well regarded by younger fans (or these days those with nostalgia for the 80s). The Lost Boys was a project that Schumacher inherited from Richard Donner, the director of The Omen (1976) and Superman (1978), who remains attached to the finished film as a producer. In pre-production The Lost Boys was billed as a vampiric version of Peter Pan (1953). Outside of appropriating the name of the eternally adolescent boys that Peter Pan encounters and the shrewd teen-aimed advertising byline, “Sleep all day. Party all night. Never grow old. Never die,” this is a concept that seems to have vanished somewhere along the line, bar the title. Certainly, a vampire film pitched at adolescents makes for some amusing interpolations of the genre’s traditional trappings – water-pistols filled with holy water, vampires being staked through the heart with a toy bow and arrow, vampire lore learned from a horror comic. Joel Schumacher offers up an atmospheric beginning with the camera gliding across the ocean to a deserted carpark where the roof is snatched off a car into the air by unseen assailants; the accompaniment of a haunting rendition of The Doors’ People Are Strange by Echo and the Bunnymen; the sign entering Santa Carla – a sunny tourist promotion ‘Welcome to Santa Carla’, which is revealed to be graffitoed ‘World Capital of Murder’ on the other side, a promisingly symbolic dichotomy that remains subsequently unexplored; and the first few minutes racing through a beachfront carnival into weird mind-games with Chinese takeaways in a debris strewn cavern; to a beautifully dreamy scene hanging from a railway overbridge as the vampire’s drop one by one into the mist, leaving behind a sweating Jason Patric in the path of the oncoming train. However, that is about the point where the film’s initial promise dissolves into a good deal of silliness. As though having exhausted himself creatively in the first few minutes, Joel Schumacher spends the rest of the film piling on gaudy lighting, loud noise and ridiculously overblown effects. The vampire lore becomes increasingly ludicrous in the inconsistency with which it is applied – some vampires have a reflection, others not; some vampires are burnt by the sun, others are able to walk about in daylight; Jason Patric faces comic problems in becoming weightless and floating away but this side-effect is forgotten about and is something that none of the other vampires experience; one vampire has to be invited into the house, yet during the climactic scenes the others crash their way in through the walls of the house at will. 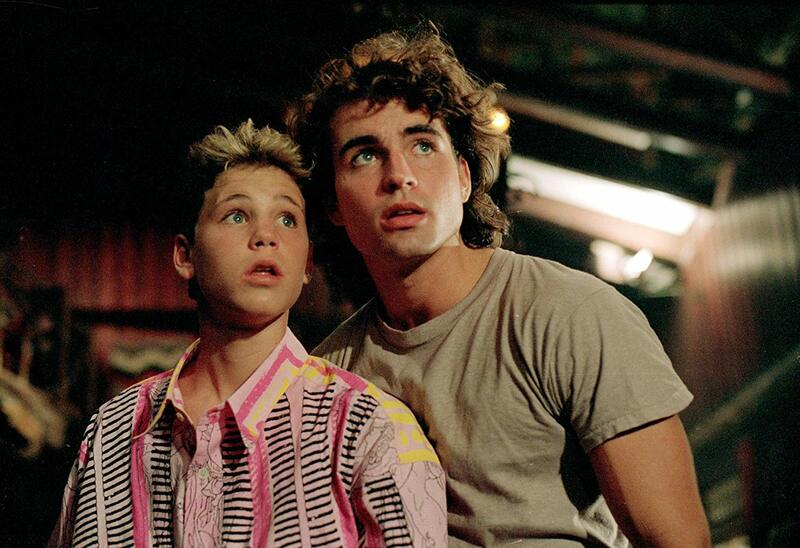 By the time one has reached the climactic finale with taps spouting blood, fireplaces blowing up and vampires crashing headfirst through walls, The Lost Boys has become so over-the-top it interests nobody. Like most Joel Schumacher films, The Lost Boys is a pose of flashy visuals and zero substance underneath. It is a film where Schumacher seems more interested in the lighting schemes, his good-looking young teen cast and their New Wave chic, and in appropriating trendy Fright Night (1985)-styled vampire makeup effects, than he does consistency, seriousness or scares. 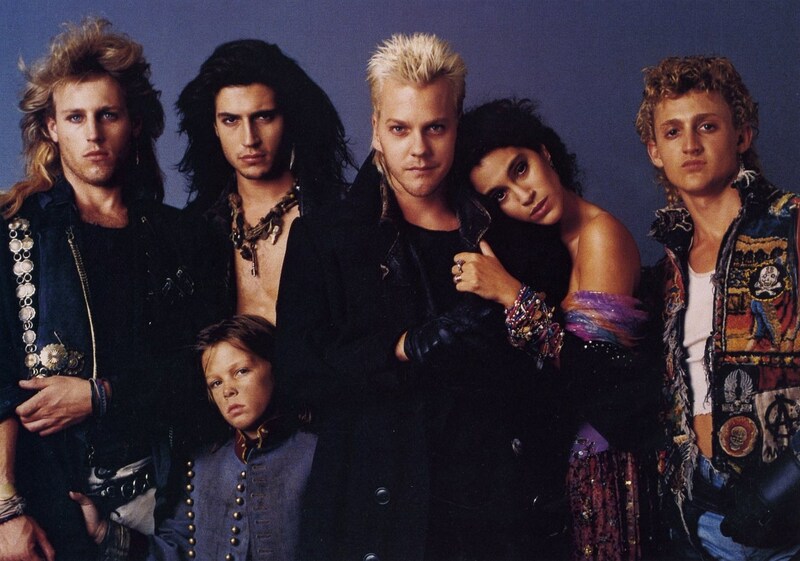 The Lost Boys was one of the first films in the 1980s to start recasting vampires as lawless badasses who live outside society and feed on the edges of it. The Lost Boys came out the same year as the excellent Near Dark (1987), which featured a similar plot of a young man being abducted into a gang of lawless vampires after being seduced by a girl. Near Dark had a visually dazzling, dangerous edge; whereas in The Lost Boys anything vaguely scary is offset by comedy, while its vampires seem to have no threat of any depth beyond looking like extras from a Duran Duran or A-ha video. Twenty years later, there were two dvd-released sequels with Lost Boys: The Tribe (2008), featuring a return performance from Corey Feldman and with Kiefer Sutherland’s half-brother Angus playing the another vampire gang leader, and Lost Boys: The Thirst (2010) featuring return performances from Corey Feldman and Jamison Newlander. Joel Schumacher’s other films of genre interest are:– The Incredible Shrinking Woman (1981); the afterlife film Flatliners (1990); his two ventures into the Batman movie franchise Batman Forever (1995) and Batman & Robin (1997); the offensively redneck psycho film Falling Down (1993); the snuff movie thriller 8MM (1999); the psycho-thriller Phone Booth (2002); the musical adaptation of The Phantom of the Opera (2004); The Number 23 (2007) with a numerologically obsessed Jim Carrey; and Town Creek (2009) about a Nazi vampire. Screenwriter Jeffrey Boam delivered several other scripts of genre interest including David Cronenberg’s adaptation of Stephen King’s clairvoyance thriller The Dead Zone (1983), Joe Dante’s Innerspace (1987), Steven Spielberg’s Indiana Jones and the Last Crusade (1989) and the comic-book superhero adaptation The Phantom (1996), as well as the wrote scripts for the first two Lethal Weapon sequels and created the tv series The Adventures of Brisco County, Jr. (1993-4), a Western with SF elements.